What a spectacle! I’m American, so I thought I knew all about The Temptations. I thought since I’ve seen the movie eight times, I could grasp the power these men commanded on stage. 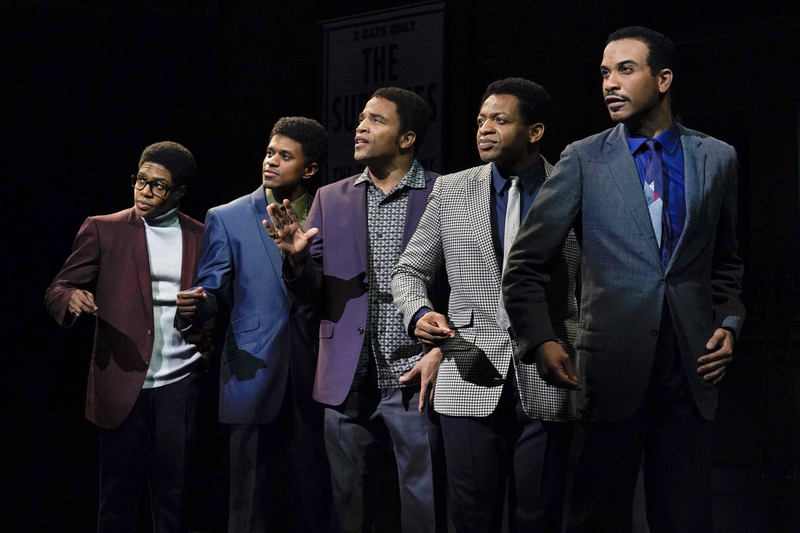 “Ain’t Too Proud—The Life and Times of the Temptations” brings the 60s back to life with thrilling young actors and soul-stirring music. The Motown style belongs exclusively to Detroit, Michigan, but the Motown experience belongs to the world. The classic Eddie Kenricks (Jeremy Pope) smile lights the stage as if he cannot help but shine. When Paul Williams (James Harkness) puts his soul into Sergio Trujillo’s choreography, the audience dances in their seats. In the musicals I’ve seen recently, the male dancing has been repetitive and traditional. What a treat to see strong men, busting masculine moves, in hot, elegant suits. “Ain’t Too Proud” presents The Tempations as the essential Motown experience—just as it happened in the 60s. Ephraim Sykes, Jeremy Pope, James Harkness, Jared Joseph, Derrick Baskin. Photo: Carole Litwin. Director Des McAnuff rolls out some cool sliding stage sections, so that people and scenery zip on and off, creating an exciting pace for the story. One minute we see actors outside under the trees and next minute we see actors in a jail-cell. The swift scene changes kept me on the edge of my seat. Playwright Dominique Morisseau uses the book written by the gentleman who started The Temptations, Otis Williams. She makes sure that most of the musical’s dialogue comes from Williams’ memoir. 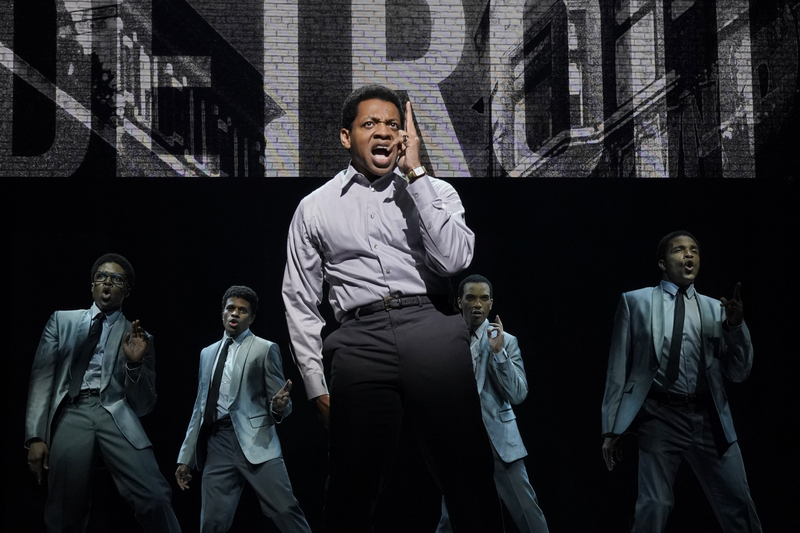 The Temptation’s bass singer Melvin Franklin (innocent Jared Joseph) springs off the page and into our hearts. Franklin hides behind a tree from his mother, while teenage Otis Williams (Derrick Baskin) begs mom to let Melvin sing. Thanks to Joseph’s perfect comic timing and delivery, my favorite Temptation is still Melvin Franklin. Each actor/singer fits his role like a Motown tune. Otis narrates, using a southern Baptist preacher accent, adding to the drama. Even while smiling Baskin’s eyes are sad and tired, but he skillfully welcomes us into Otis’ pensive riffs. Familiar songs such as “I Wish It Would Rain” and “Shout” waft in from the background during Otis’ narrations. Then Otis smoothly inserts himself into the performance. Each song represents an important incident or milestone in their journey to top-billing: it’s a musical rags-to-riches story. When the Civil Rights Era climaxed in 1967 with the Detroit rebellion, The Temptations had a front row seat.. They felt helpless as they watched Detroit burn from their tour bus. On stage, the somber phone call announcing Dr. King’s death ignites political urgency at Motown Records. Business-minded owner Barry Gordy (Jahi Kearse) does not think it wise for Black artists to be involved in politics. Gordy believes that protest will upset his White customers. But the band has a mission. Have you ever had an older person tell you that music isn’t what is used to be? They’re right. The smooth counter-tenor voice of Eddie Kendricks and raspy voice of David Ruffin (Ephraim Sykes) awed the audience in a way I only see in a Black church service. All of the Temps leave beautifully broken hearts on the stage. Today’s music is not segregated as much as the 60s, but is the music a healing force, or a catchy distraction from our social crisis? In “Ain’t Too Proud,” we feel the 60s war between Blacks and Whites. a war between love and hate. Today, we battle big corporations, greedy politicians, those who abuse power. We know who they are. The Temptations express their political involvement subtley, but they bring separated citizens together. That’s what entertainment does. The Temptations still promote awareness and togetherness. Their art provides peaceful yet powerful forms of activism. Encore! 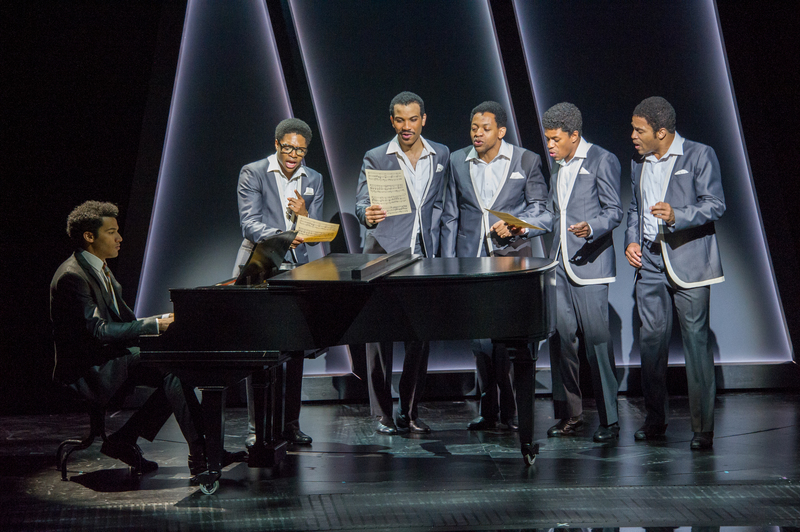 I need to see “Ain’t Too Proud—The Life and Times of The Temptations,” again. Though I was born in the 90s, I grew up watching the movie and reading Otis Williams’ book. 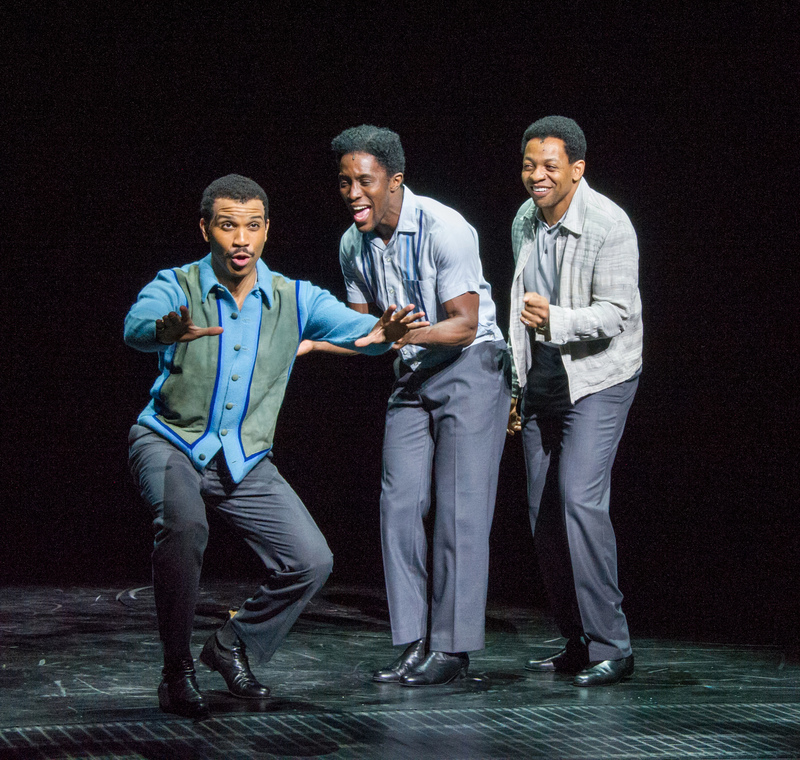 Morisseau’s musical is right on time, a rock and roll reminder of the power of the artist. We need them now more than ever. Christian Thompson, Ephraim Sykes, Jared Joseph, Derrick Baskin, Jeremy Pope, James Harkness. Photo: Carole Litwin. Cast: Derrick Baskin, Jared Joseph, Jeremy Pope, James Harkness, Ephraim Sykes, Jarvis B. Manning, Jr ., Naisa Thomas, Taylor Symone Jackson, Jahi Kearse, Christian Thompson, Candice Marie Woods, Rashidra Scott, Jeremy Cohen, Caliaf St. Aubyn, E. Clayton Cornelious, and Shawn Bowers. “How I Learned to Drive” Stings with Candor, at Custom Made Theatre, S.F.